Today I saw Greek homeless men cooking food, on a mass scale, for refugees. Not discriminating who can get what dependent or defined by nationality, but simply, food for the hungry, cooked by the hungry. I’m not sure about whether miracles exist or not, but I felt that I witnessed something miraculous. Something with the shape and colour and innocence of miracles. During the day I went to use the toilet in the waiting area of the Athens harbour. It is full to the brim, split evenly between homeless locals and refugees. On leaving I saw a group of people, locals, setting up a pop-up-soup-kitchen. 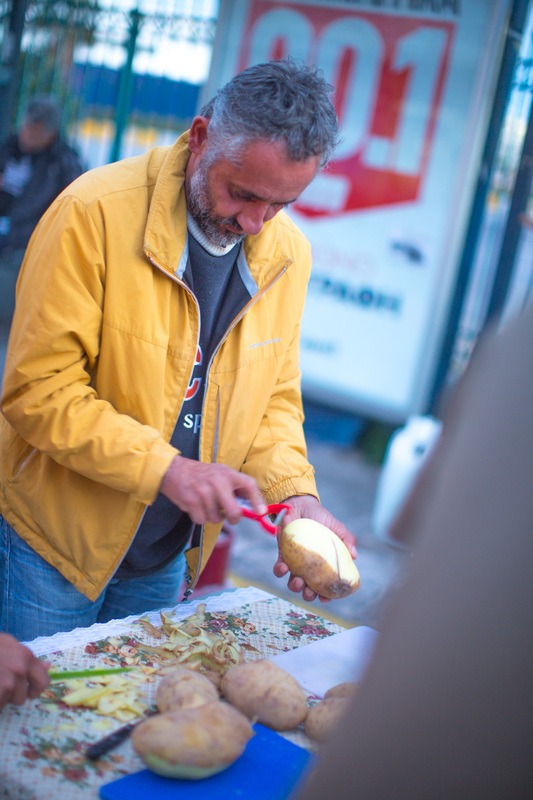 I asked if they needed help peeling potatoes, grabbed a peeler from the van, and took my place next to the local Athenians, and some homeless men. One of them, Thomas, was deeply critical of the size and shape of my potato cutting, but under intense scrutiny and instruction, I gradually became a better pupil, much to the delight of my toothless master. After a few hours, and as the light died down, an orderly line formed of both homeless people and refugees. I was lucky enough, after everyone was fed, even to get a taste myself, and dam hell, it was the best meal I’ve had in some time! All the locals contributed something, and Lydia, a farmer, topped it all off with a huge jug of Greek olive oil, all of which of course went into the broth. It struck me that something which is not so often reported about in the news is the positive side of this crisis. What I mean is that even in my very short time on the road, I have come across so many open attitudes, interesting insights and people contributing in their small way. Yes, I am very aware that the Golden Dawn (the far right party) is a huge growing concern in Greece, and not to be, for a moment, taken lightly. But I do marvel at the capacity of these local people – whose economy is in taters – and their ability to contribute, to welcome and to share. These are values which appear so scare in such times as ours. But in digging a little deeper, I am heartened to the core to discover that they are, after all, not in such short supply. And if a homeless fella with nothing in the world can find such a contribution to make, I feel inspired to look again at my own. It is not the first time you truly make my day by writing such lines! Thank you!